Registration is open for the Academy’s first professionalism webinar of 2019, “Promoting Ethical Decision-making: Rules, the Human Brain, and Unconscious Biases,” which will be held on Thursday, April 18. The Academy will use its new and improved webinar vendor for this event, so be sure to register early. The webinar will feature an engaging discussion with a professor of business law and ethics who focuses on the fundamentals of behavioral decision-making and unconscious biases and how they affect judgment. Presenting will be Anita Cava, professor of business law and director of the business ethics program at the University of Miami School of Business. Also on the program will be Council on Professionalism member Ken Kent; Lisa Slotznick, the Academy’s vice president, casualty; and Brian Jackson, counsel to the Actuarial Board for Counseling and Discipline (ABCD). The 90-minute webinar will start at noon EDT. Register today. The Academy is now partnering with BlueSky eLearn for our webinars. When registering for your first webinar with this new provider, you’ll be prompted to also register with BlueSky. For ease of future access, record the email address you use to register, as well as the password you create, so you can easily log back in to access Academy webinars. 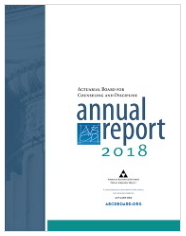 The ABCD released its 2018 Annual Report. Last year the ABCD handled 148 cases, comprised of 109 requests for guidance (RFGs) and 39 inquiries, in line with the previous year. It received 13 inquiries and closed 22 inquiry cases. Of the closed inquiry cases, 13 were dismissed, seven resulted in counseling, and two were resolved with a recommendation for discipline. A chart showing the number of cases handled by the ABCD since its inception in 1992—including RFGs and inquiry cases—is included in the report. Richard Block stepped down after two years as chairperson and six on the ABCD, and David Ogden is the new chairperson. Deborah Rosenberg and John Stokesbury are vice chairpersons; Rosenberg was reappointed to a second three-year term; Alice Rosenblatt and Ken Kent were appointed to their first three-year terms; and Mary D. Miller was appointed to the remaining year of a three-year term. The Actuarial Standards Board (ASB) recently approved an exposure draft of a revision of Actuarial Standard of Practice (ASOP) No. 22, Statements of Actuarial Opinion Based on Asset Adequacy Analysis for Life or Health Liabilities. The standard applies to actuaries when performing actuarial services with respect to providing a statement of actuarial opinion (SAO) related to asset adequacy analysis of life or health liabilities, when the SAO is prepared to comply with applicable law based on the model Standard Valuation Law and VM-30 of the NAIC Valuation Manual, or when the SAO is prepared to comply with other applicable law. The comment deadline for the exposure draft is June 1. All are welcome to offer input to the ASB through this public process. Information on how to submit comments can be found in the exposure draft. Register today for the Academy’s 2019 Life and Health Qualifications Seminar. This annual seminar delivers three days of training and instruction, providing attendees with the opportunity to obtain the basic education necessary for qualification or to obtain relevant continuing education (CE) credit to issue actuarial opinions for either the NAIC Life and Accident & Health (A&H) Annual Statement or the NAIC Health Annual Statement. Professionalism credit also will be available. The seminar will be held Nov. 10–14 at the Key Bridge Marriott in Arlington, Va. (Washington, D.C., metro area). Register early, as seating is limited. A reminder to members to submit your recommendations for Academy regular directors, who are elected to the Academy Board of Directors by Academy membership in an online election from a slate of candidates presented by the Academy’s Nominating Committee. The committee will meet in the coming weeks to identify new candidates for regular directors in accordance with the criteria provided in the Nominating Committee Guidelines. Review the criteria and how to submit nominations in the Academy’s Board Election Center. Nominations are due May 1. Enrolled Actuaries Meeting—April 7–10, Washington, D.C.
PBR Boot Camp—April 8–10, Orlando, Fla. Comments from Academy Senior Life Fellow Nancy Bennett were cited in a subscriber-only Insurance ERM story about the NAIC discussion of introducing a longevity capital charge for U.S. insurers that will affect how risk-based capital is calculated. Pensions & Investments published a (subscriber-only) letter to the editor that cited the Academy’s 2018 issue brief, Loan Programs for Underfunded Multiemployer Plans. An Actuarial Review article cited the Academy’s role as a co-sponsor of the Actuaries Climate Index.